Pre-Cut 36" Crystal Rhinestone Rose Gold setting White Pearl Bridal Trim Marquise Teardrop Stones. This trim has finished ends so it could be used as an long applique. 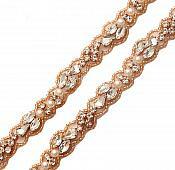 This trim has a rose gold beaded edge making it nice for a colorful border or edge.